Hubpages: 13.3 million visitors looking at 416,000 hubs! Today’s blog is an update from a previous blog. Back then (8 months ago), we had 8 million visitors and 200,000 hubs and I wondered if the ratio of 40 unique visitors per hub would last. It didn’t. Our current ratio is 32 unique visitors per hub. Writing a blog or a hub is a lot like fishing. The bait (hopefully) is the quality content of your site. Your best chance of finding a nice fishing hole comes from finding a place with the most fish in relation to the least fishermen. This in essence is the justification for analyzing web sites by their ratio of unique visitors to content. Let’s look at some popular web sites to see how their ratio compares with HubPages. WordPress has a total of 115M blog posts published and gets 189.7M unique visitors each month so it’s ratio of about 2 Squidoo has nearly 900,00 lenses and gets 10.4M unique visitors. Rounding up, that’s almost a ratio of 12. Associated Content says that they have more than 1.4M published articles and gets 21.6 monthly unique visitors. That’s a ratio of 15.4. So, based on these sites, I think that a ratio of 32 is pretty good. 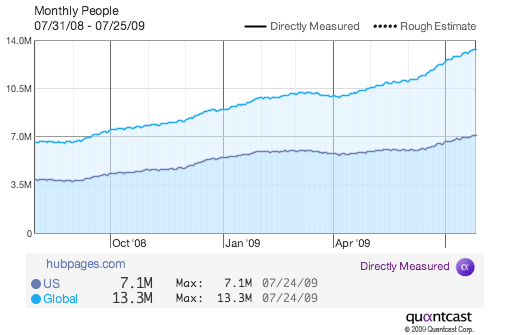 It is interesting that one year ago, HubPages had roughly 7.1 million unique visitors worldwide. Now, we have the same amount in the US. If we were to repeat that trend, then by next year, we would have 13.3M visitors in the US which would make us (using the current numbers from Quantcast), the 48th most popular web site in the US (we are currently #123). Not surprisingly, this graph shows that the rate of growth of total hubs published outstripped the rate of growth of the visitors. Will current trends continue over the next year? Will HubPages become a top 100 destination in the US? Will it become a top 200 destination world wide? We at HubPages hope that this is the case. For those interested in tracking the current number of hubs on HubPages, we now have a page with the current stats. 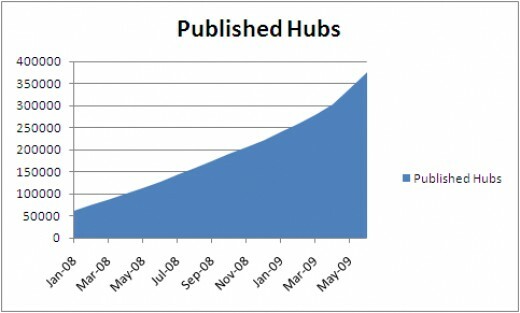 ← The New, Ongoing 30 Hubs In 30 Days HubChallenge — Wanna Join? This new page on your site is great! its amazing that hubpages can run with only 7 employees! Kudos to you guys! Wow! l love hearing how we are doin here, lol. Thank you for this info, Larry. 🙂 It’s nice to know that we are part responsible for this rise. This must explain why my traffic on hubpages has gone up as well. 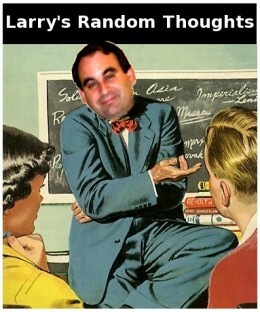 Great stats Larry – all good to hear! Great and encouraging stuff. Thanks for letting us know. You guys are great! Thanks for updating the previous hub and letting us know about the hardwork we are doing over here. I agree with your explanation given by the example of fishermen and fishing and got the hind right in my mind. Kudos to everyone’s success. This is great to hear, I can’t really complain at all about the traffic here on Hubpages. Thanks for all of your hard work! It is interesting to note that already Hubpages is now up to 113 on the Quantcast rankings for number of US visitors. It also makes sense that the over time the growth in total number of articles will exceed growth in numbers (for example all those hubs created linked to the US election in 2008 probably get very few views now). The traffic is greatly increasing day by day. I’m well impressed on the continued increase of visitors to my hubs. “Will current trends continue over the next year? Will HubPages become a top 100 destination in the US? Will it become a top 200 destination world wide?” Yes! It will become among the top 200 destination world wide. It will only get better. Thank you HubPages team and the HubPages community. Iam very impressed while reading this information its a great achievement made by this hubpages.Thanks for your hard works. I agree with your explanation given by the example of fishermen and fishing and got the hind right in my mind. Kudos to everyone’s success.